When we opened the box and she saw the cute little dogs inside, her face lit up with excitement! She was amazed when I started opening up one after the other! I showed her how they came apart and nested within each other! She was absolutely fascinated! Note: the littlest dog could be considered a choking hazard with her being being only 15 month, so I only allowed her to play with that one under my supervision. It definitely wouldn’t be a problem for 3+ year olds! Since infants don’t have dexterity or fine motor control yet, they use their entire hands to place, hold and explore objects. When it comes to toddlers, learning how to control and position their fingers when grasping is such an important skill to master. 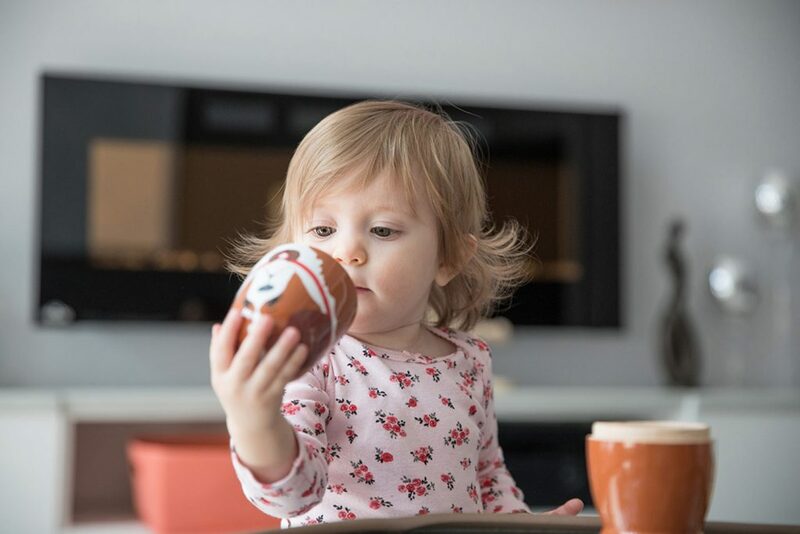 The learned skill of intentional grasp and release helps with picking up and holding objects. Have your child start with the largest of the nesting dogs and work their way to the smaller ones. As your child progresses, they’ll be able to judge how to nest the smaller ones as they refine and control their placement. This presents a challenge to your child to try to figure out which dogs fit, and in what order they need to be stored to get them to all go together. You’d be surprised what this can do when it comes time for your child to eat; less mess for mommy to clean up and more proud aha moments! Around the age of 6 months and up, babies begin to gain their postural stability and are able to sit up by themselves. This new ability allows them to stabilize their core as they use their hands and move about, coordinating their movements. Also known as the protective response, these multi-tasking activities of sitting while doing an activity gives them an opportunity for their body to “catch themselves” and make adjustments to maintain their balance. 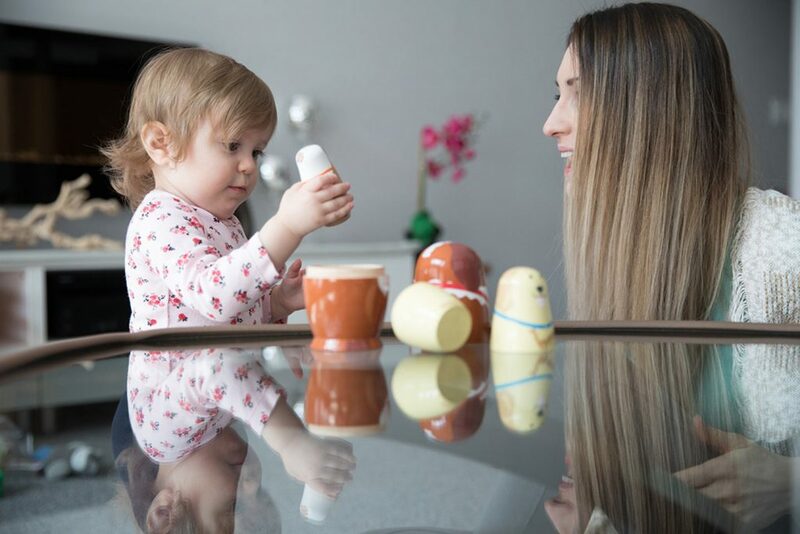 Spatial recognition and hand-eye coordination are all improved with nesting/stacking toys, as it helps with understanding where your body is and self awareness. With each nesting dog, children have to visually gauge where to place each piece in relation to their bodies and the other pieces. Stacking toys tend to be for older children, but nesting toys are much easier as a starter toy. The nesting design offers guidance in the early stages of visual perception, therefore, is more forgiving. Any toy presents an opportunity for language skills and the chance for your child to learn concepts and words. Using the different dog sizes, you can teach comparisons such as: big and small, big, bigger, biggest etc. Another lesson you can add, to pretty much any toy, is the names and colors of the objects. Each dog is painted in a different shade, giving you a chance to differentiate to your child the various colors present. I would definitely recommend this toy! Not only is it “Paw-sitively Awesome”, but it’s also extremely educational and that is a win-win in the mommy book! My daughter couldn’t get enough! These adorable “Paw-sitively Awesome” Dog Nesting Dolls (Set of Five) are available for purchase at She’s The Fun Mom. Hey, this is a nice review of the toys. Really like the way you have presented exhaustive list of benefits. Thank you Disa for your kind words!